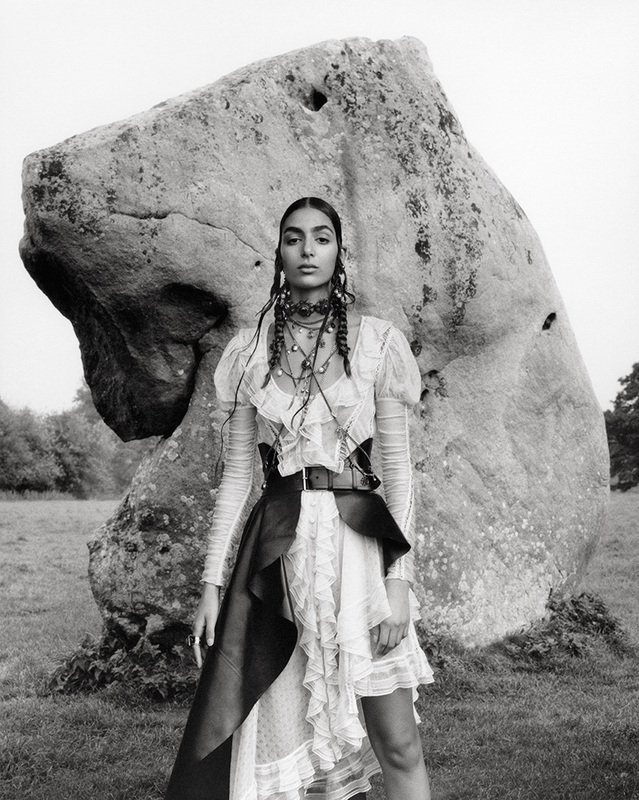 Moroccan-British model Nora Attal stars in the SS19 campaign for Alexander McQueen, alongside Lara Stone and five other models. Shot by Jamie Hawkesworth, Attal is seen in the key pieces from the upcoming collection designed by creative director Sarah Burton, which is due to land in stores next month. The 19-year-old, who only recently walked in the Chanel SS19 Haute Couture show in Paris, was photographed with Binx Walton, Chunjie Liu, Jean Campbell, Jill and Kesewa Aboah at Avebury in the UK. Avebury is a Neolithic henge monument containing three stone circles, around the village of Avebury in Wiltshire. It is one of the best known prehistoric sites in Britain and contains the largest megalithic stone circle in the world. A fitting location to showcase a collection that is a blend of hard of soft with Burton’s contrasting use of leather and lace as well as edgy jewellery.